Hello from Canada. We finally got started after jumping through many hoops to get licensed in Calgary. We are operating in the downtown core in an area called Stephen Avenue Mall -an outside location. I thought you might want to read a review that was written about us. totally enjoyed all aspects of this business. Your product has been well received with many compliments and the phrase used most often is “very refreshing”. Children and tourists love getting their pictures taken with their blue and red tongues – its really quite funny to watch. The cart is amazing and after a full day out in the hot sun we still come back with frozen ice. While watching the final hours of the London Summer Olympics on Stephen Ave, I was able to enjoy a somewhat international treat I had only heard about before and is now available on Stephen Avenue. the treat has a long history of delighting children on boardwalks, playground, and sporting events. In addition to being the top frozen treat on the eastern seaboard, Italian Ices have the fortunate distinction of being free of dairy, fat, cholesterol and high fructose corn syrup. That’s right, for those who are sensitive to dairy, or are watching their cholesterol can rest a littler easier knowing that there is a delicious way to beat that heat, that won’t set your stomach in to a tizzy. 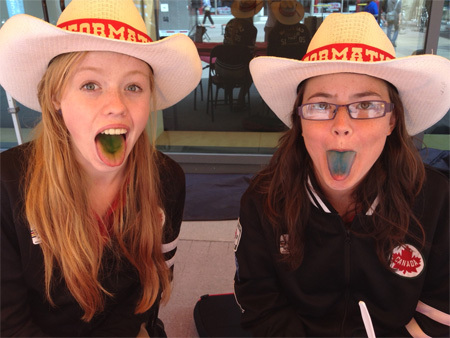 The ices come in several flavours including Cherry, Lemon, Blue Raspberry and Green Apple and tou should be able to spot anyone who’s tried these delicious treats on Stephen Avenue by their distinctively brightly coloured tongues like our hosts Victoria and Nicola shown above. between Olympic Plaza and 3rd street SW) for the rest of the summer!